Rohinton Mistry's Family Matters is one that has sat on my family's bookshelf, unread by me, for several years. To be honest, many Indian authors sit unread by me. In general, I've found them depressing, almost to the extent that Russian authors are depressing, and I avoided their books for this reason. But, also similar to really good Russian authors, Indian writers can have a lovely wistfulness about what India used to be and what it is now - the potential for greatness fighting against the penchant for corruption. And Rohinton Mistry does this in his novel, and he does it with a truly lovely turn of phrase. I listened to Family Matters on audiobook, and this only added to my experience of the novel. Martin Jarvis was the narrator, and though I do not think he is Indian, he did the Indian accent very well and was spot on in the way he imbued his voice with the hopefulness of young children and the resignation of middle-aged adults. He was helped, obviously, by the lyrical writing style that Mistry used. Rohinton Mistry’s enthralling novel is at once a domestic drama and an intently observed portrait of present-day Bombay in all its vitality and corruption. At the age of seventy-nine, Nariman Vakeel, already suffering from Parkinson’s disease, breaks an ankle and finds himself wholly dependent on his family. His step-children, Coomy and Jal, have a spacious apartment (in the inaptly named Chateau Felicity), but are too squeamish and resentful to tend to his physical needs. This book reminded me a lot of my relationship with my own grandfather who passed away some years ago. My dad is the 12th of 14 children, so when I was born, my grandfather was already quite old. He lived to be 100 years old, and for some of the later years of his life, he lived with my family here in Chicago. As I get older, I realize just how difficult growing old must be. My grandfather, and Nariman in this novel, both had very full, productive lives. My grandfather had almost perfect vision until the day he died. He was intelligent and kind and very well-respected. He raised 14 kids and worked hard his whole life. But all I saw was a fragile old man who was so hard of hearing that we often just gave up on including him in conversation and talked around him. Looking back, I can only think of how unintentionally cruel we must have been, and how extremely isolated he must have felt even when surrounded by his own family. Rohinton Mistry's book brought all this back to me. He portrays a family adjusting to the difficulties of caring for an elderly relative, one whose company they enjoy occasionally but do not necessarily want every day. How easy it can be to lose your patience with a person when when he's not to blame for the situation at all, and is just as mortified and distraught by it as you are. 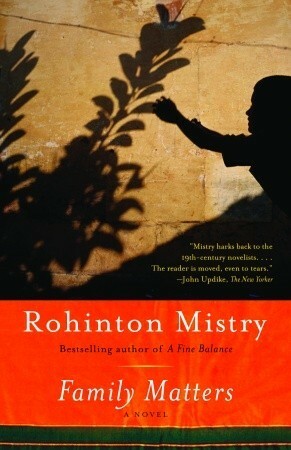 Mistry details how there can be resentment among siblings, anger between spouses, and stress on children, but he also gives us moments of light, when the bond between a young boy and his grandfather is forged, and the many ways in which you can learn so much about what people's lives were before you entered them. He writes about love and friendship, anger and despair, and he does it all with so much empathy for his characters and their plights. It was a beautiful book, and I highly recommend it. Thanks for recommending this book to me. I always appreciate your suggestions, especially about books about India. I have been "saving" this one of his for ages. For long enough that, now, I could really just go back and reread all the others. Yes, it's been that long. But you know how that happens. Still, thoroughly enjoyed reading your perspective on this. And I am really, really looking forward to reading it (and, also, rereading the others). That does sound very beautiful! I have his Fine Balance on my shelves that I have been procrastinating for the same reason. Now though I want to read it.